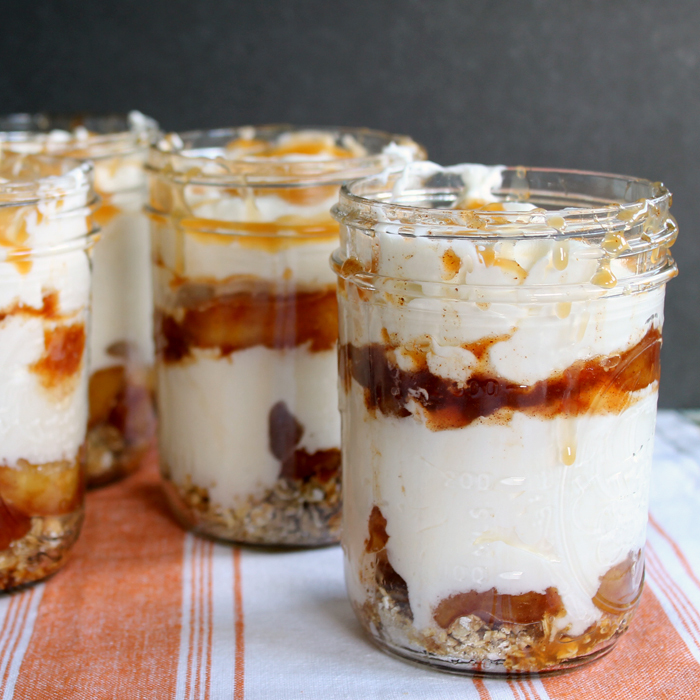 You are going to love this caramel apple cheesecake recipe in a jar. Make this simple no bake dessert for your family any night of the week. I love serving up apple desserts in the fall so this one was a perfect idea for fall week in jars. Don’t forget to scroll to the bottom of this post and see the other fall jar ideas from our blog partners for this series. You can also click here if you missed day 1 of this event. Stay tuned all week as we bring you great ideas for fall using jars. Start by making apple pie filling. Peel, core, and slice the apples. Add to a saucepan with the sugar. Cover and cook until tender. Remove from heat and mix in cinnamon. Mix whipping cream, milk, and cream cheese with a mixer on high for 1 – 2 minutes. Peaks should form. 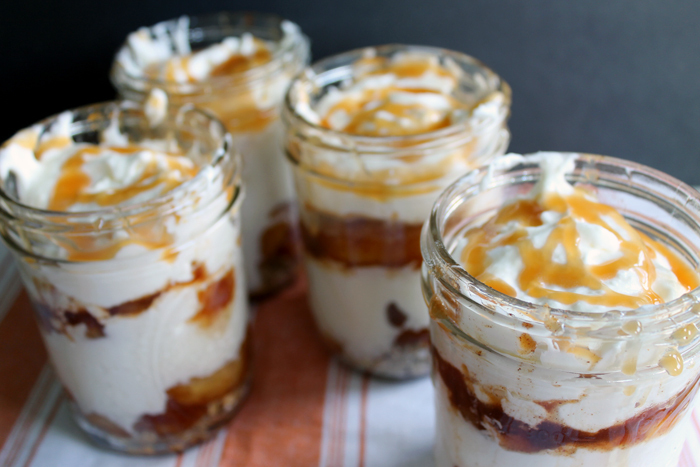 In mason jars, layer cream cheese mixture, apple pie filling, and caramel ice cream topping. Repeat layers until jar is full ending with caramel ice cream topping. Serve up this delectable dessert any night of the week. Everyone will love this caramel apple cheesecake recipe. When served up in a jar, this dessert is extra special. If you are looking for a new way to serve a no bake dessert, this recipe is for you! I love a dessert you do not have to bake….don’t you? Add to a saucepan with the sugar. Remove from heat and mix in cinnamon. Mix whipping cream, milk, and cream cheese with a mixer on high for 1 - 2 minutes. In mason jars, layer cream cheese mixture, apple pie filling, and caramel ice cream topping. Repeat layers until jar is full ending with caramel ice cream topping. I love recipes in jars! These look amazing! This is the type of recipe I love to take to bonfires. Thanks for sharing! Ooooohhh! That looks delicious! I may have to give this one a try. Well doesn’t this sound amazing! YUM! 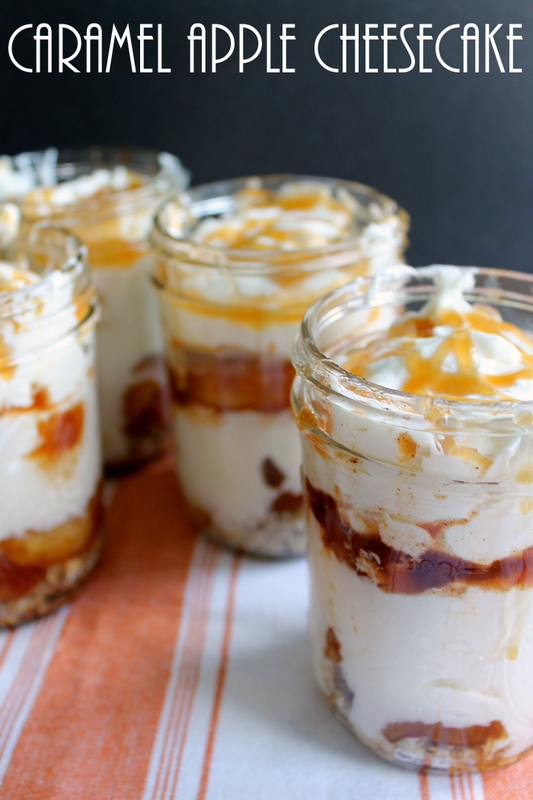 Your Caramel Apple Cheesecake in a Jar looks fabulous, just a perfect dessert for fall. Thanks so much for sharing with us at Full Plate Thursday and have a great weekend! These look so yummy and perfect for a fall dessert! Looks scrumptious! I’m pinning. Perfect recipe for fall! I’m drooling, caramel, apples and cheesecake you can’t go wrong with that combo. Thank you for sharing at the Creative Muster Party. PINNED! Well, this just sounds heavenly! YUM. Yes, please! These look so yummy! Thank you for sharing at DI & DI 🙂 We enjoy your creativity each week! Yum! These sound delicious! Thanks for linking up with Creative Spark; I’m featuring your recipe at this week’s party, which starts tomorrow at 6am EST. Hope you’ll stop by and link up again! These are going to be a big hit with the famly! Thanks for sharing at the #InspirationSpotlight party. See you again soon. Shared. In the last picture it looks like there is something crumbly at the bottom. A secret ingredient? You caught me! I did add granola to the bottom of mine but it just was not very good! I eliminated it for the recipe for you! It will make four of the jars shown. Yes. They should hold well. I would skip the granola in the bottom however. Or make all of the parts and assemble them right before eating. My mouth is seriously watering after seeing this recipe. It is a good recipe. I can select for my next weekend. Thank you to share it. I will be making this this week – Can’t wait! My mouth is watering after seeing the pics I really want to try this. Thanks for sharing it.